When Ja’el Mosley ’12 was a young girl, she created a business that profited an impressive $45 a day. Her plan was simple yet brilliant. Choose a target market she knew well – kids. Pick a product that’s in high demand – candy. And sell, sell, sell. “I was the only candy lady around, and they ate it up,” Ja’el says, reflecting back. Now Ja’el owns a screenprinting and embroidery business, Ja’el’s S.P.E.E.D , which was recently featured on Fox8 news. 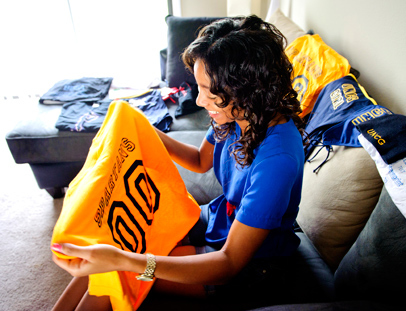 The majority of her clients are UNCG students and staff looking for custom-printed items like shirts, pens and mugs at a competitive price point. She is currently expanding the business to include university swimwear. Ja’el’s first taste of entrepreneurship came when she was just four years old. She made napkin holders from dozens of hand-traced turkeys. Her clientele were customers at her father’s business – the first black barber shop in Mauldin, SC. Ja’el was raised around entrepreneurs. Her parents are business owners. And her grandfathers started the first black car lot in their hometown. As an older child, Ja’el made and sold what she called “Bible Beads” – bracelets and necklaces with religious sayings on them. Then she became a mother’s helper, got certified by the Red Cross, and started a babysitting business. Anywhere she saw a demand, she envisioned a business to answer it. Ja’el is studying event management in the Department of Community and Therapeutic Recreation. But when Bryan School of Business and Economics professor Joe Erba met Ja’el, he encouraged her to take entrepreneurship classes. One class stands out: Erba’s “Campus Entrepreneurs” course. It taught her how to formulate a business plan, and as one of three students earning Campus Entrepreneur Awards, ultimately gave her the opportunity to secure funding from The Bank of Oak Ridge to start a campus-based business. Ja’el has proven she is adept at putting her mind to something and accomplishing it. But her goals involve helping others advance as much as herself. She speaks to youth groups and has mentored at-risk girls, advocating for better decision-making and for going to college.